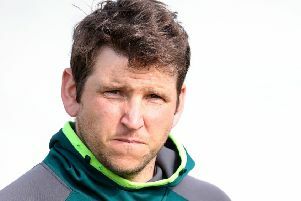 Lurgan’s National Cup campaign suffered a six-wicket reverse at the first-round stage on Saturday against Newbuildings. Lurgan required almost 20 overs to reach the 50-run mark - at the expense of three wickets. Calum Grieve posted 22 and Stephen Chambers finished on 18. Niranjan Godbole and Peter Maxwell put on a stand of over 100 - with the former on a superb century at over a run per ball. Maxwell’s 30 proved a reliable addition to the overall tally of 219 for six after 50 overs. Godbole closed the innings on an unbeaten 119. Newbuildings, however, raced off to 47 runs after 10 overs for the loss of a single wicket. A 164 partnership proved the foundation of the innings, with Allen on an unbeaten 118 as the hosts moved beyond the Lurgan tally at 44 overs. Grieve claimed the wickets on figures of two for 36 in nine overs. It proved a disappointing start to the season for Lurgan, with the locals playing host to Premier League champions Instonians this weekend in the Senior Challenge Cup. Victoria thirds’ Junior League Nine meeting with Lisburn fourths finished in a two-run defeat. In the Ulster Bank Schools’ Cup, Lurgan College lost out across the first round to Regent House by seven wickets based on the net run rate. The College scored 169 for five thanks to S.Harrison (45) and P.Froggatt (33 not out).